Joseph Young put up 30 points, seven rebounds and four assists; Elgin Cook added 20 points, and Jalil Abdul-Bassit finished with 15 points to help the Oregon Ducks men’s basketball team defeat the Colorado Buffaloes 93-85 in the quarterfinals of the Pac-12 Tournament in Las Vegas, Nevada on Thursday night. Swingman Dwayne Benjamin replaced Jordan Bell in the starting lineup minutes before tipoff, and the Buffaloes came out of the gates swinging by taking advantage of Oregon’s depleted size. Colorado connected on its first two shot attempts, and a three-point basket by Tre’Shaun Fletcher gave the Buffaloes an early 7-0 lead. Young got the Ducks on the scoreboard with a layup, but Colorado’s spacing and ball movement on the offensive end confused Oregon’s defense on multiple occasions. The Buffaloes’ relentless attack gave them an early 14-6 advantage. 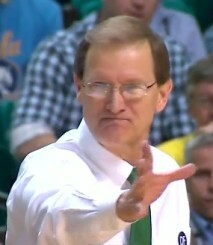 Dana Altman was not pleased with they way his ball club started the game, and after calling a timeout, Oregon pressured Colorado with a full court press. The Ducks reeled off six straight points to cut the lead to two, but the Buffaloes’ efficiency on the offensive end trumped Oregon’s quick run. 18 of Colorado’s first 26 points were scored inside the paint, and the Buffaloes’ quick defensive rotations prevented the Ducks from gaining any offensive momentum. Oregon missed its first eight three point attempts of the game, and the men in green and yellow were only shooting 28% from the field midway through the first half. With about five minutes left in the first half, the Ducks locked in defensively by locating Colorado’s shooters and running them off the three-point line. Oregon’s rotations also sealed off driving lanes, and after forcing turnovers on consecutive possessions, Abdul-Bassit and Young connected on back-to-back three point baskets to tie the game at 31-31. 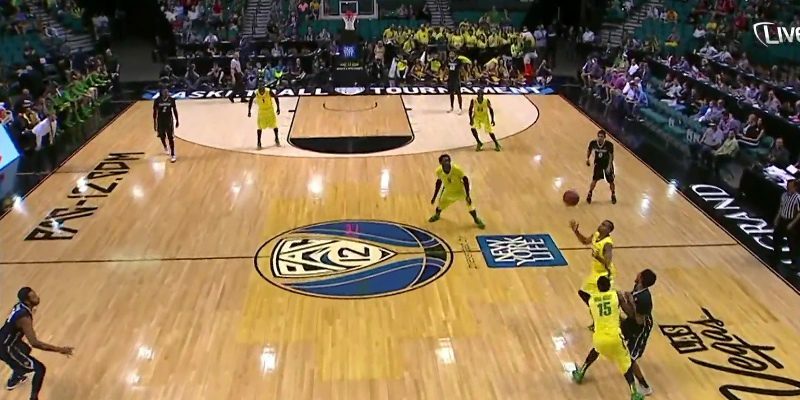 However, the Buffaloes went on a 6-3 run to end the first frame and the Ducks trailed 37-34 at halftime. Young only scored eight points during the first 20 minutes of the contest, but his poor shooting first half didn’t hold him back. The Pac-12 player of the year scored Oregon’s first five points of the second frame, and his defense led the way for the Ducks. The senior guard spearheaded Oregon’s full court press, which rebuffed Colorado’s offensive game plan. The Buffaloes had a difficult time initiating their offense, and the Ducks’ feisty defense allowed them to go on a 21-5 run. Oregon led 65-51 with nine minutes to go in the ballgame. Oregon led by 18 points with six minutes remaining in the contest, but back-to-back three-point baskets by Askia Booker propelled Colorado on a 15-4 run. The Buffaloes trailed the Ducks 80-76 with a minute and a half left on the game clock, but Oregon’s leading scorer was determined to prove that the mighty Ducks wouldn’t go down without a fight. 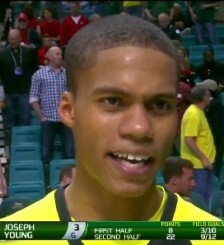 Young scored four straight points to give Oregon a six-point lead, and the Ducks never looked back. The high-scoring guard out of Houston, Texas scored 22 of his 30 points in the second half. Oregon will play the Utah Utes in the semifinals of the Pac-12 Tournament on Friday night.